This Mystery is a good "starter" pattern. The quilt is made up of basic block units, and comes together nicely with a little patience and attention. Early on in our Mystery Quilt Series, some of our projects were a bit simpler to make. 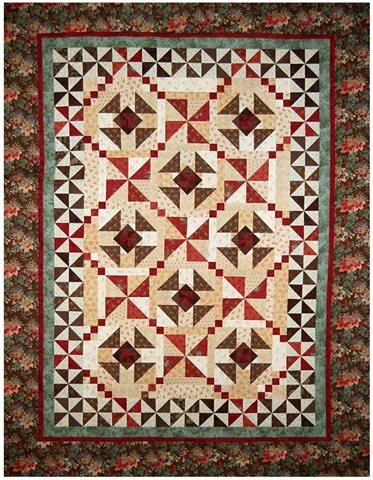 This is a fun quilt to work on, and uses some basic block units: half-square triangles, flying geese, and four-patches. You can make this quilt in two sizes: Throw and Queen. Yankee Pride Quilts provides a bit of a bonus in our mystery patterns - we give you guidance in choosing the fabrics for your quilt. Fabric choice can be a stumbling block for lots of quilters, but we try to help make it easier. Click here for information on yardage requirements and fabric selection. NOTE: Some directions in this packet are handwritten.